Steel grain silos are widely applied in food processing, transport and other fields for the advantages of high land utilization and high degree of automation, short construction period, low cost of investment, etc.With the needs of economic development, the current steel silo in the use of obvious trend is single warehouse capacity is more and more big. Is gradually increasing with the storage, how to guarantee the smooth out of the warehouse as steel silo design used in the problem that needs to be addressed. In some cases even be project start is the decisive factor. Including concrete foundation (concrete cone hopper) and all steel support two. 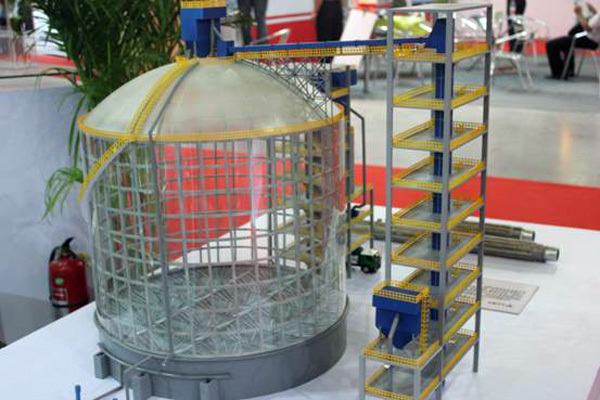 The advantages of this way of discharge is: materials could flow out naturally leaves no residues in the silo; the working principle is simple, no need to install auxiliary equipment; Storage room can be made full use of, there is no room wasted, the bucket shape can effectively increase the storage; Adopt steel structure it has the advantage of short construction period. The disadvantage is that: the bucket height is bigger, so the silo foundation is higher, and the foundation cost increases. If the silo diameter is too big, the cost of the foundation will be more than the cost of steel silo itself. So this way of discharging is generally not suitable for large diameter steel silo. Its advantages are: there are basic no residues in the silo; it also uses the material weight to fall and flow out of the silo, no need of auxiliary equipment; Silo foundation is lower than the cone bucket flow for the material is lower. Defect is: backfill occupied part of storage room, resulting in a decrease of the actual storage capacity. Storage loss is extremely significant for the larger diameter silo. So this way of discharging generally is only suitable for small and low diameter silo. Drill multiple discharging hole according to certain distance on the silo foundation board (usually odd number) The advantages of flat bottom multi discharge hole are: there is no backfill in the warehouse, all storage can be used for storage purpose. The disadvantage is that: within the silo material can't be discharged by weight, other means and equipments have to be used to assist clearance. Assist clearance ways: sweeping silo machine and loaded vehicle clearance, clearance in some artificial cost relatively cheap place also has a direct use of artificial cleaning. The fact is that prices are higher for steel silo to use complicated machine, the cost is higher while a big number of silos and sweeping silo machine. If you want to adopt the way of loading vehicle clearance, one extra job has to be done is to open a hole big enough in the silo wall sweeping silo machine to go though. It could also be resolved by the design of a large silo door, which can effectively solve the difficult problem of sweep silo machine in and out. Use the backfill slope (smaller Angle) as a special shape of air duct, and put sieve plate on the duct. The theory is to use the function of air flow, make the residual material on the air duct becomes a state of suspension. Fluidization discharging advantages are: use of auxiliary fan to help discharge, less residue in warehouse; Backfill quantity is reduced, storage loss is less. In addition, for the quantity of air duct is well designed and laid evenly, the ventilated effect is satisfying. The disadvantage is that: backfill technology is complex; former construction is difficult; there is still a part of the storage loss; material discharge ability is not stable. Poor quality of grain, high impurity makes harden case easy to appear during storage process and destroy the material fluidization state. When the wind blown open a gap in the grain pack, grain flow short circuit happens, most of the wind will blow from the gap to the silo, since it can't blown air duct on grain of other places, grain can’t be unloaded successfully. Air duct damper seal is not good, cause air leakage, make corresponding duct air volume is insufficient and can't form stable fluidization state. Air duct shape is not in conformity with the aerodynamics, partial resistance is too big to lead to lack of air volume.